- With a sharp knife, poke some holes in the eggplants (prevents them from blowing up while cooking). - Either grill the eggplants, or broil them in the oven (flip them occasionally either way). They're cooked when a knife easily goes all the way through the eggplants (after about 30-40 minutes). - Peel the eggplants: you can either cut each in two and scoop out the interior with a spoon, or slowly peel the exterior away (periodically dip your fingers in cold water to avoid burns). Let drain for a four-five hours or overnight. - Mash the eggplants with a fork, or puree them in a blender. - Add a few drops of lemon juice. About three should usually be enough, but that certainly depends on the size of your eggplants. If you don't have lemon juice, a few tablespoons of mayonnaise will also do the trick. - Chop the onion, and mix as much as you want with the eggplants. As a Romanian, I'd probably use all of it - I love the taste and the crunchiness. If you further want to avoid the after-smell, you may want to lightly broil the chopped onion in a bit of oil separately, then mix with the eggplants. - Finely dice the cherry tomatoes, and add to the mixture. Also, add a few tablespoons of olive oil. Mix thoroughly. - Chill in the fridge before serving. 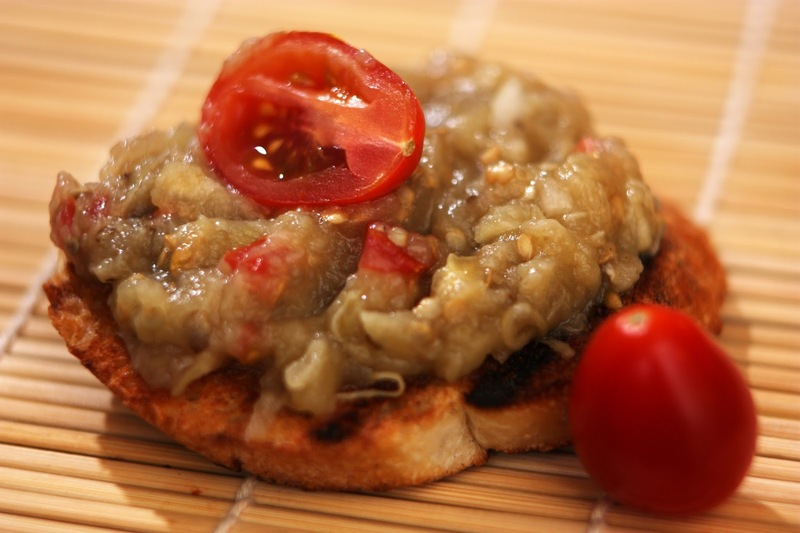 - Lightly toast some slices of bread (for texture and color), and spread the eggplant salad on top. Add a few thin slices of tomatoes on top. - Alternatively, stuff some larger tomatoes with the eggplant salad, and present next to a few toasted slices of bread. The guests can then spread the salad over the bread slices themselves.